A Kansas woman who became national news when she graduated from college at the age of 95, and continued taking classes until she was 100, has died. Nola Ochs (OHsh) was 105 when she died Friday at a senior living home in Dodge City. Ochs earned a general studies degree with an emphasis in history from Fort Hays State University in 2007. 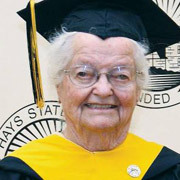 At the time, the Guinness World Records said she was the oldest college graduate in the world. She then earned a master’s degree in liberal studies with a concentration on history in 2010, at the age of 98. She continued taking classes until age 100 before returning to her family’s farm near Jetmore.